This video, featured below, made me laugh and get misty-eyed at the same time. Can the end of the Jay Leno era be this near? No matter the answer, at least his successor, Jimmy Fallon, is playing nice, allowing Jay to leave with the dignity he so deserves. The idea behind this video originated with Jimmy, who then flew to LA to record the segment. In case you are wondering, those are professional voices singing to the tune of West Side Story’s, “Tonight”. 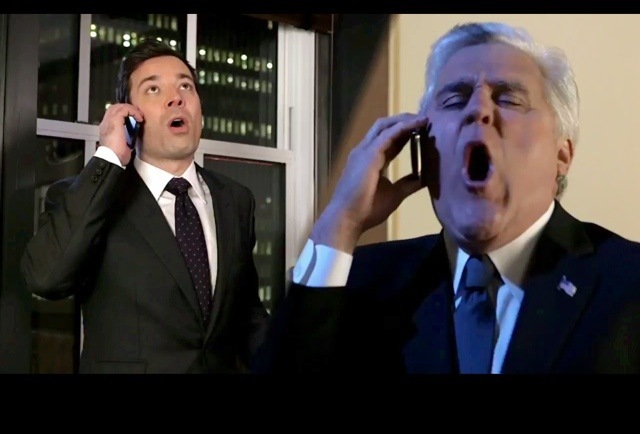 But, Jay and Jimmy do an excellent job of lip synching. – they could teach a few performers a thing or two about how to lip synch with believability and precision. Ha! If Jay moves to the Fox Network as rumoured, this could be a very sticky situation for NBC and Jimmy Fallon’s duties as The Tonight Show’s new host. Presently, The Tonight Show With Jay Leno is sitting at Number One in the late night ratings war. Does it make sense to replace him now? Strange timing. Although, Jay could leave on a high note, which is not necessarily a bad thing at all. Better that than risk lower ratings in the future. I would hate to see Jay slug away and fruitlessly compete for viewership with Jimmy Fallon or Jimmy Kimmel a couple of years from now. Anyway, enjoy the video. It is very cute and extremely well done! Oh, and by the way, check out Jay’s circular mouth position in the picture. Perfect. Now, if he would just not raise his head for those high notes… Ditto for Jimmy! What do you think Jay should do? Your opinions matter! Voice them in the comments section below. very well done. i can see where you would be misty eyed.